i have a 24″ mini tree i bought several years ago and have slowly been changing into a prop for my mnf and smaller girls. it is approx 24 inches tall so on the scale of a 7′ tree. i wish i had thought to take a picture of it “before”. it used to have really ugly outsized berries and huge globs of “snow”. 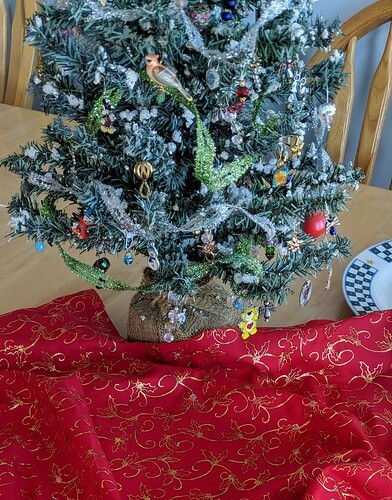 i have removed most of that and replaced them with better scale, mostly homemade ornaments. adding a few more each year. 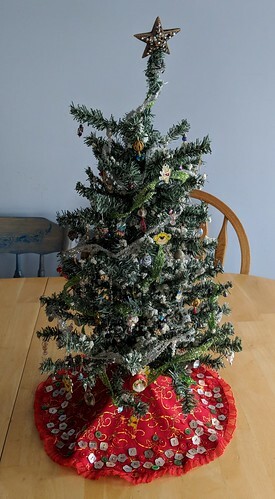 unfortunately while i was working on it, i left it on my south facing kitchen windowsill and noticed that this year instead of having a nice green pine, it has faded to more of a blue spruce :(. not sure if it is possible to recolor it? especially since the ornies are wired on and would be hard to remove. if you have any suggestions on how to fix it, please comment below. 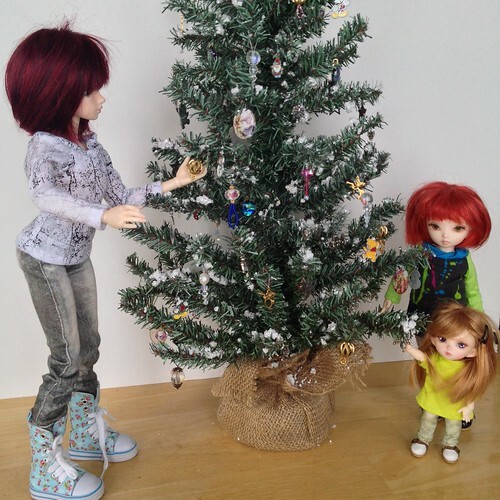 otherwise my girls will just have a spruce tree. something that is much more common here anyway, so i guess it works? 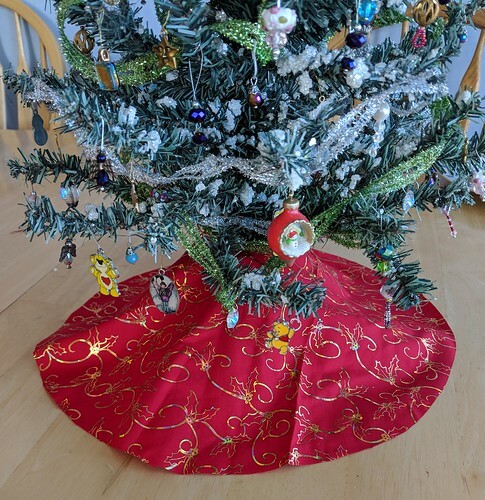 the tree had a burlap bag around the bottom and i have wanted a tree skirt to cover it since the beginning. i had elaborate plans but never got around to doing it so today was the day! my first attempt was to make an origami white felt skirt using a pattern i’d saved ages ago. it looked nice flat but didn’t suit my tree, so into the recycle bin it went. 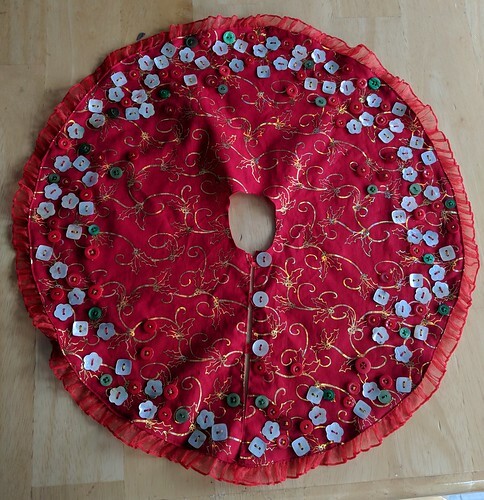 i spite of careful measuring, the lining made the skirt too stiff, it stuck out and didn’t hit the floor. so attempt two also went into the recycle bin. this time i decided to make it just a single layer. i cut the appropriate circle, then slit up the back and trimmed the center till it was just wide enough to wrap round the trunk. i think it is kind of fun and quirky. it’s all made from supplies unearthed in my craft purge, and should be plenty big enough to hide the battery pack from my fairy light string that will go on later this week.